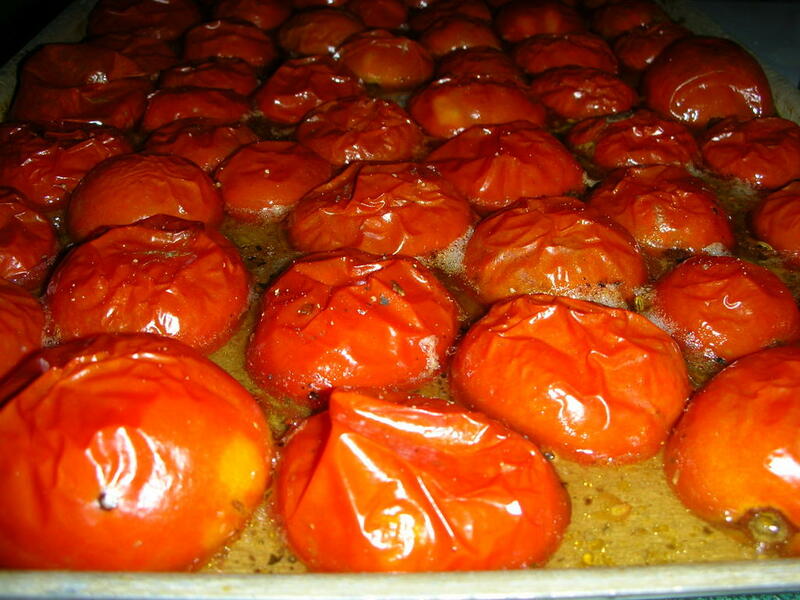 After oh-so-many successful batches of Slow-Roasted Tomatoes, I began to wonder if the same wonderful sweet-roasted flavor might be achieved at a higher temperature. I consulted reliable sources for combinations of temperature and time, ranging from 350F to 500F and 20 minutes to 45 minutes. Batch 13: 400F, 25minutes. Face down on 2 tablespoons olive oil, salt and pepper, fennel. 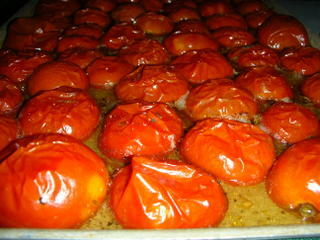 Yielded 3 cups tomato PLUS 1 1/2 cups liquid (see the picture) so MUST use rimmed baking sheet. Think liquid is result of high temperature with tomatoes face down. Took 30 minutes til cool enough to handle. More like stewed tomatoes. Okay but nothing close to slow-roasted. Batch 14: 400F, 90 minutes (I think). Face up, misted with olive oil, sprinkled with salt and pepper, fennel. No standing juice but yield only 1 1/2 cups. Some burned spots on skins and pan. Took 30 minutes to cool. Flavor less like stewed tomatoes and closer (but not comparable) to slow-roasted tomatoes. Batch 15: Didn't want to waste what are likely the last tomatoes this season. Decided to return to Slow-Roasted Tomatoes. The more I cook, the more I find patience and a longer, slower cooking time are the way to go. There is a way to fast roast tomatoes so they keep all the juice. Just when u put it cut side down put it on a mesh tray that will act like a grill at high temperatures (450F). And it will basicaly grill the sliced part of tomatoe and keep all the liquid inside. You can put some s&p or other spices, but only on top of the skin, cause otherwise salt andspices will draw extra liquid out of tomatoes.